Let's Encrypt is a system created by the Internet Security Research Group that went public on December 3rd 2015 and allows the creation of completely free SSL certificates using a utility that runs on the server hosting the SSL sites. Their own User Guide is quite self-explanatory for dealing with usual server configurations and even supports a fully automated configuration. Simply install from their Github repo and run the letsencrypt-auto script (this script automatically updates everything if you've done a git pull on the repo to update it), or on Debian systems you can simply use apt. Their system is based on a new protocol called ACME (Automated Certificate Management Environment) which the ISRG created specifically for the LetsEncrypt project. Here we're using the --webroot domain validation method which allows you to specify the file-system paths in which LetsEncrypt should place the validation files for your domains so that it can find the file from an external request to each domain to verify your ownership of it. The keep-until-expiring option is only needed when running the command automatically from the crontab to make the script automatically skip any certificates that are not close to expiry. Using this option means we can run the command on a daily basis to keep the certs for as long as they last. Another option would be to use the --renew-by-default option instead and run the command on a monthly basis. The expand option is also only needed when running the command automatically to prevent the command from requiring the user to confirm that the command replace the existing certificate and expand the number of domains it covers. Note that this method does not require root privileges, the script only needs to access the DOC_ROOT/letsencrypt directory which can be set to very restricted ownership that only LetsEncrypt and the web-server can access. To further simplify the situation we've included this rewrite rule in our nginx.php.conf file which is a file that is included within the server blocks of any domains that need PHP functionality (i.e. all of them). This way there's no need for any configuration specific to LetsEncrypt within the sever blocks themselves, and the SSL configuration (which is also a separate file included into server blocks that need it) only needs to refer to the single LetsEncrypt certificate that applies for all the domains. Note: the "@" sub-domain stands for the naked domain. This script also maintains a symlink from /var/www/ssl/le-latest to the most recent certificate directory, because LetsEncrypt uses a new directory to store each new certificate that it creates which means that all the config files that use LetsEncrypt certificates need to be updated. This way they can refer to the *.pem files in /var/www/ssl/le-latest instead. One other thing the script does is to ensure that the privkey.pem file is of mode 644 so that Exim and Dovecot have permission to read it even though they're not running as root. LetsEncrypt wildcard certificates are ready (see here for a list of supported clients), BUT they only work for the DNS-01 validation method, not the HTTP-01 method that we use. Also --server https://acme-v02.api.letsencrypt.org/directory must be added to the letsencrypt-auto command currently since the ACME endpoint still defaults to v1 which doesn't support wildcards. There is this DNS tool available to allow for simplified DNS-01 validation, but we're sticking with non-wildcard and HTTP-01 for now. HPKP instructs a user agent to bind a site to specific root certificate authority, intermediate certificate authority, or end-entity public key. This prevents certificate authorities from issuing unauthorized certificates for a given domain that would nevertheless be trusted by the browsers. These fraudulent certificates would allow an active attacker to MitM and impersonate a website, intercepting credentials and other sensitive data. Due to the risk of knocking yourself off the internet, HPKP must be implemented with extreme care. This includes having backup key pins, testing on a non-production domain, testing with Public-Key-Pins-Report-Only and then finally doing initial testing with a very short-lived max-age directive. Because of the risk of creating a self-denial-of-service and the very low risk of a fraudulent certificate being issued, it is not recommended for the majority websites to implement HPKP. Although there are risks to implementing this, Scott Helme's HPKP Toolset makes the process a lot easier. First you can get the hashes for your current certificate from your site URL, then a hash from your PEM-encoded certificate public key. The add the hashes to a Public-Key-Pins header. First we need to ensure that we have a valid SSL certificate for each domain that will be using SSL connections. First generate a self signed certificate for each domain. Remember that this will raise the "untrusted secure site" error in the client browser, for sites that require a proper commercial certificate, use the generate a certificate request for a commercial Certificate Authority procedure instead. Our convention is to keep all the certificates in /var/www/ssl, so first change the current directory to that and create the certificate with the following command format. Ensure the common name (cn) is entered as a wildcard such as *.foo.com so that the certificate applies to all the sub-domains such as www.foo.com or webmail.foo.com etc. This certificate format will work for both Apache and Nginx. Check the config before restarting with apachectl -t or nginx -t, and if everything is fine, start or restart the web server from /etc/init.d as usual. After starting, follow the web server error log as you start the server and as you make SSL requests and see if problems show up. With revelations about mass surveillance in the news everywhere, such as this article, an obscure feature of SSL/TLS called perfect forward secrecy has suddenly become a very important feature to enable. You'll need at least OpenSSL version 1.0 and Apache version 2.3.3 (or Nginx which has supported it for quite some time now). First check that your version of OpenSSL supports elliptic curve Diffie-Hellman protocols. If you have support for it, you'll get a long list of output like the following example, or if not you'll get an "Error in cipher list: result. You can then set the protocols in your cypher suite to an optimal list and prioritisation. You can use Qualys SSL labs test or the Aeris test which is more strict. I'm not sure if it's possible to get a combination of ciphers that satisfy everything. The best I've come up with is a value that allows perfect forward secrecy and mitigates the BEAST attack, but it allows RC4 which vulnerabilities have been found in, but haven't yet been exploited in any way. Here's a screenshot of the best result I've managed to obtain (and the best I've seen from the top results in their chart). It's a good idea to also change the default logging format so that you can see what cipher clients are connecting with - especially to ensure that your own browser is using a ECDHE cipher. Mozilla has a good page on cipher sets for different levels of security versus backward compatibility here. 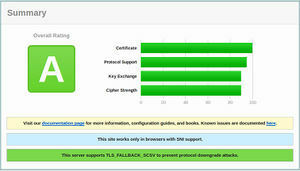 We also run a number of other SSL certificates in the system which may need rebuilding from time to time. See the appropriate procedure for each one for the details on building the certificates. On April 7, 2014, it was announced that all versions of OpenSSL in the 1.0.1 series up to and including 1.0.1f had a severe memory handling error in their implementation of the TLS Heartbeat Extension. This error could be used to reveal up to 64 kilobytes of the application's memory. The vulnerability had existed since December 31, 2011, and had been adopted to widespread use since the release of the OpenSSL version 1.0.1 on March 14, 2012. By reading the memory of the SSL server, attackers could access sensitive data, compromising the security of the server and its users. Potentially vulnerable secure data include the server's private master key, which enables attackers to break the encryption of the server's earlier eavesdropped communications and impersonate as the server. The vulnerability might also reveal unencrypted parts of other user's sensitive requests and responses, including session cookies and passwords, which might allow attackers to hijack the identity of another user of the service. At its disclosure, some 17% or half a million of the Internet's secure web servers certified by trusted authorities were believed to have been vulnerable to the attack. [more...]. Why do root CAs override certificate pinning?